If you are not part of the closed world of ultra-Orthodox, or haredi, Jewry, or within the Orthodox rabbinic fraternity, you are more than likely completely oblivious to the release last week of an obscure newsreel from 1923, which for nearly a century has remained unseen, languishing on some dusty shelf in an obscure storage location in the United States. However, for the Orthodox community, the release of this footage is without exaggeration one of the most sensational media events to have occurred in the history of modern media, right up there with how secular audiences perceive movie footage of Neil Armstrong walking on the moon or of the Titanic’s discovery deep in the Atlantic Ocean. Not quite five minutes long, the silent newsreel consists of a series of movie clips showing various rabbis and dignitaries exiting a public street into a gated courtyard and walking toward a stationary camera. At exactly 57 seconds into the reel the camera focuses on a little old man in a tall cloth cap, surrounded by attendants, as he slowly ambles toward the camera, barely looking up. At the 1 minute 9 second time-point, the camera lens is abruptly covered over by the hand of someone accompanying the elderly man, and he disappears from view. 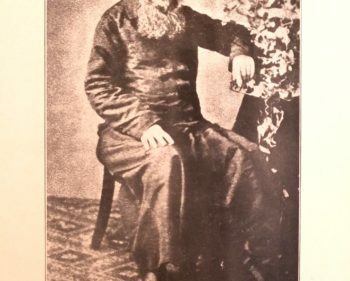 The man fleetingly captured on camera is Rabbi Yisrael Meir Kagan of Radun (1838-1933), known universally by the name of his magnum opus, Chofetz Chaim, the author of numerous published works, including the 20th century’s definitive halakhic work, the Mishna Berura. What you must know is this: Not only has there been no known movie footage of this rabbinic luminary, there are barely any photos of him either. Those that do exist—besides one famous and ubiquitous headshot—are too grainy to be consequential. For Orthodox Jews brought up on countless fables of this mythical man’s spirituality and purity, the appearance of this movie footage offers an incredible and never dreamed of opportunity to observe 12 seconds of the Chofetz Chaim’s life and to see him in real life, as it were. It seems that an American news team—from Twentieth Century Fox’s newsreel division—decided to cover the first-ever gathering, in Vienna, of the Agudat Yisrael, the groundbreaking political representative organization for Orthodox Jewry founded in 1913, and formally launched in 1919. Anyone and everyone in the Orthodox world was going to be at that momentous conference. Everyone except the Chofetz Chaim. For the orthodox Jewish masses, the Chofetz Chaim is the most pious man alive today. Most don’t even know his name. Those who do, never use it. His entire persona has become synonymous with the name of his celebrated ethical work. A panic broke out in the convention hall—“the Chofetz Chaim is coming.” Everyone jumped up onto their seats and focused their gaze onto the point [of his entry]. What is particularly incredible about this description is that the excitement described by Bublick erupted only moments after the 12-seconds of movie footage that emerged last week was shot. Just prior to thousands of eyes straining to catch a glimpse of the 85-year-old rabbinic luminary, he had made his way into the convention center off the street, flanked by Rabbi Arye Leib Poupko, his son and first biographer, before the Fox news cameras. Amazingly, more than 90 years later we are now able watch him at our leisure. The movie footage might never have been shot at all. The Chofetz Chaim’s visit to Vienna was not a foregone conclusion and for months had been the subject of fevered speculation. Although he was very much behind the proposal to create Agudat Yisrael in 1913, the Chofetz Chaim was known to be reluctant to be involved in the nitty-gritty of communal politics, and more often than not he left the practical aspects of ensuring the application of ideology and theology to his colleagues and disciples. Jewish journalists across the spectrum argued that when push came to shove, the controversy-averse Chofetz Chaim, who was revered well beyond his own constituency of Torah-observant Orthodox Jews, would not support the agenda of Agudat Yisrael by attending its first public event, as it was widely perceived as partisan and divisive. Yes, he had been one of its founders, they acknowledged, but he had merely supported its creation to promote the idea of Torah-observant Jewish unity in a world that had seen the formation of a proliferation of Jewish representative groups that represented Jews but not Judaism. In practice, however, he would never allow his universal popularity to be clouded by partisan political affiliation. As it turned out, they were wrong. In early September 1923, the Chofetz Chaim and a small group of family members and attendants set off from his hometown of Radun, in Bielorussia, in a third-class train compartment, for the three-day journey to Vienna. As their journey progressed, the Chofetz Chaim was joined by other leading European rabbis, including, among others, the Grand Rabbi of Ger, Avraham Mordechai Alter, and Rabbi Meir Dan Plotzki of Sokolov. The latter joined the Chofetz Chaim in the third-class compartment as a mark of respect. At each train station the train was mobbed by Jews of every age and persuasion, eager to gain a glimpse of the rarely seen aged rabbi. Rabbi Plotzki remonstrated with him and argued that the gathered crowds would be incredibly inspired if they saw him and that his reservations were therefore misplaced. Nonetheless, the Chofetz Chaim shook his head and explained that his acceptance of honor in this world would reduce his deeply anticipated spiritual reward in the World to Come. Moved by this argument, the Chofetz Chaim rose and walked over to the coach window. When the crowd realized that the old man at the window was none other than the Chofetz Chaim they began pushing and shoving so that each one of them would get the chance to shake his hand. He motioned to them to stop and told them he would not be shaking hands with anyone, and returned to his seat. At each station the same thing repeated itself, but he remained unmoved by the deluge of admiration. Even when he was given the first speaking slot at the conference, he dismissed the honor as merely an accommodation for an old man and respect for someone of priestly descent. But his humility was irrelevant. The entire congress was completely dominated by his presence. Wherever he went crowds gathered and hung on his every word. The conference turned out to be one of the most momentous Orthodox gatherings in modern Jewish history, indubitably as a result of the Chofetz Chaim’s attendance. Two of the programs initiated that week in Vienna, considered radical in 1923, remain mainstays of Orthodox Jewish life to this day. One was the Agudat Israel’s establishment of formal schooling for girls under the banner of Sarah Schenirer’s Beit Yaakov movement. The other was the launch of Daf Yomi, a coordinated schedule for ordinary laypeople to study one page of Talmud each day, so that wherever you would be in the world you could slot in to a local Daf Yomi group and complete the 2,711-page cycle together with other participants each seven-and-a-half years. These programs would never have gained widespread acceptance had it not been for the Chofetz Chaim, such was the power of his authority. Although a little man in stature, his towering presence left a deep impression on everyone who had come to Vienna, including the secular Jews who had predicted that he would never attend. When you first see the tiny ninety-year-old [sic] man he makes a strange impression—you feel a shudder of awe and love, an enormous boundless respect. When you look more closely you see the face of an angel, a servant of God—the Divine Presence rests on that face and you must close your eyes because of the brilliance that shines from the small, gray, wise eyes. When he stands at the rostrum to speak … everyone stands to listen to him. His voice is soft but clear. He calls Jews to unity, to peace, to goodness, to piety, to love, and to action. His small, bent frame shakes as he speaks. His small white beard glows like freshly fallen snow, and from his eyes glows an entire world of wisdom and goodness… This is how I imagine Hillel the Elder must have appeared. Now, more than 90 years later, we have been given the unexpected chance to observe the Chofetz Chaim, albeit for only a few seconds, during his brief time in Vienna and to stand alongside those who fought for a glimpse of this icon of Jewish leadership. We have found the opportunity completely overwhelming. Seeing the Chofetz Chaim is something we never expected to be able to do in our lifetimes. But there he is. This article was co-authored with Menachem Butler, and appeared in Tablet.